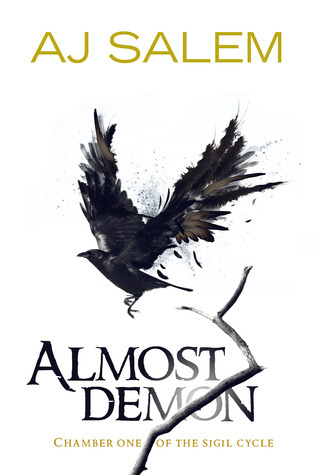 I almost liked Almost Demon. The story had all this potential! It had demons, summonings, and things that go bump in the night. Those are some of my favorite things so why then did I not it? Well, first off, the main character Gemma was all over the place. One second she was curious about what was going on around her and the next second she didn’t care and would rather go on a run. I never felt like I actually got to know her. It was like I knew things about her but didn’t connect with her as a person. Gemma felt superficial. The second reason I didn’t care for this story was because of the terrible love triangle-ish thing that was happening. Gemma meets two guys, Ian a new kid in town, and her English teacher Mr. Flynn. She develops different kinds of relationships with both guys but there is a romantic tilt to each of them and I couldn’t stand either character. Ian was always rather sketchy, and Mr. Flynn kept secrets and came off as controlling. There wasn’t much to like. The final nail in the coffin was Almost Demon’s terribly jumpy plotline. There was so much going on that nothing was given the correct amount of page time. Things were either explained in painful detail or glossed over. I felt like I only got half the story and was left to piece together the pieces for myself. Overall, despite featuring some of my favorite things this novel was not for me. I failed to connect to any of the characters and found the world building and explanations lacking. Still though, I did like the concept so that did count for something. It indeed soundes very promising, too bad it didn't work for you. I don't think I'd enjoy it either, the negative aspects you mentioned are usually things that bother me too.